The most famous album cover shot in London is undoubtedly The Beatles' Abbey Road, which is a tourist attraction in its own right. 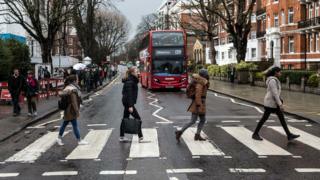 Thousands of Fab Four fans flock each year to upmarket St John's Wood where the legendary zebra crossing photo was taken - and where Sir Paul McCartney still has a home.The 1969 record is only one of many important albums to have featured a London landmark on the cover. BBC News has returned to the scene of some of the most famous records of the past 50 years to see what has changed - Click and drag the arrows on the interactive images. Pink Floyd Music/EMI. Album design: Hipgnosis (1977)Our journey begins with a story of mayhem in the skies above the south bank of the Thames, outside the largest brick building in Europe.To create the artwork for the cover of Pink Floyd's album Animal, a giant inflatable pig has been raised on a chain above Battersea Power Station - this was the 1970s after all. "Suddenly there was a large crack and the pig sailed up into the sky," sleeve designer Aubrey Powell said. "A helicopter followed but it couldn't catch it up. "We were really scared. I feared there would be a terrible airline crash. "The members of the prog rock group scarpered, air traffic into Heathrow was cancelled, RAF jets were dispatched and pilots reported seeing a pig flying at about 20,000ft (6,100m).Powell was taken to his studio by police and, following a message put out on local radio stations, a farmer from Kent called to complain that a rogue pig had landed in his field and was frightening his cows.The shoot was repeated with more success the following day, but the final cover is actually a collage of the pig stuck on a photo of the power station taken two days before. "I love the image, it's fabulous. It was so haphazard and amateurish but it just happened to work," Powell said. If a pig were to be released above the building these days, it could well get caught up in the many cranes rising above the structure.A huge project is taking place to create homes, shops, parks and Apple's new London HQ.Powell said he was "thoroughly approving" of the project. "They're doing an amazing job... it's a shame it is being cocooned by apartments on the side, but from the north and south the building looks just as magnificent." EMI. Cover photo: Brian Ward. Package Design: Reiner Design Consultants, Inc (1972)Next we step back in time five years, for a visit to the scene of the photo-shoot for an album seen as one of the most influential of the decade.Heddon Street, just off Regent's Street in London's West End, was where Ziggy Stardust landed on Planet Earth. For the album cover David Bowie was photographed standing on the step of number 23, outside a building that was being used as a makeshift photographic studio.The Starman was said to be reluctant to take part in the photo-shoot on what was a rainy January evening and later recalled, rather dryly: "It was cold and it rained and I felt like an actor. "On Heddon Street we have another example of how modernisation has transformed an album cover location.These days, the cars have gone and the street has been transformed into a pedestrianised courtyard filled with restaurants and bars.Nevertheless, posing outside in a jumpsuit on a damp January night is still unlikely to be recommended. Creation/Big Brother. Photography: Michael Spencer Jones. Album design: Microdot (1995)A 10-minute walk away is Berwick Street in Soho, the location for one of the most famous album covers of the Britpop era.The image, which was shot in the early hours of the morning, features London DJ Sean Rowley and sleeve designer Brian Cannon. If you look carefully, the album's producer Owen Morris can also be spotted in the background.The street and surrounding area was once known as the "vinyl triangle" because of the many record stores it boasted.And although their numbers have diminished considerably since 1995, vinyl lovers can still thumb through the records at the handful of independent traders that remain in business in Soho. Food/Parlophone. Front photo: Brunskill/Bob Thomas. Other photography: Paul Postle. Album design: Stylorouge (1994)Any mention of Oasis requires a namecheck for their great rivals Blur.While the famous front cover for their seminal Britpop album Parklife is a stock shot of greyhounds on the track, the sleeve features the band spending a night watching the dogs at Walthamstow Stadium.The north-east London arena hosted races for 75 years and in the sport's heyday was a money-spinner for the owners, the Chandler family.As well as the stadium's connection to Britpop, another claim to fame is that it was here football legend David Beckham had his first job, collecting beer glasses. And although Walthamstow Stadium enjoyed a brief upturn in its fortunes in the early 1990s, when it became fashionable for City boys to splash the cash at the dogs, by the time a young Beckham was earning his first crust here its glory days were long past.Hit by falling profits and attendances, the stadium finally closed in 2008 and has been redeveloped into flats and a leisure complex.Elements of the former stadium including the standings board - seen in the background of photos within Parklife's sleeve - have been incorporated into the development. Asylum Records/Warner Music. Art direction and design: Andy Hayes. Front cover photo: Ollie Grove (2013)For some artists there's nowhere like home - and for the eclectic drum and bass band Rudimental home is most definitely Hackney. Three of the four members grew up here, the band have their recording studio nearby and they credit Hackney as being essential to their sound.Indeed, in the sleeve notes drummer Kesi Dryden singles out this corner of east London as "being a place where so many different cultures can live amongst each other and learn from one another". The group reflected their love for Hackney on the artwork for their debut album, Home, which features the Dalston Peace Carnival Mural on the front cover.The enormous painting, created by artist Ray Walker in 1983, depicts the Hackney Peace Carnival of that same year.And although Hackney has changed beyond recognition since the 1980s - it's now hipster central and one of London's most fashionable locations - this particular spot is reassuringly similar.Extensive work on the mural was completed in 2014 with graffiti removed and the vibrant colours restored - the band are rumoured to have donated money to help pay for the revamp. Locked On/679 Recordings Limited. Cover photo: Rut Blees Luxemburg (2002)Original Pirate Material, the 2002 debut by The Streets, features a night-time photograph of Kestrel House in Islington.The tower block was photographed by Rut Blees Luxemburg in 1995, a few years after she arrived in the capital from her native Germany. The cover photo was taken from the top floor of a neighbouring high-rise using an eight-minute exposure. "I was part of an artist-run space called Plummet, situated on the 16th floor of a council block off City Road," she said. "It was in this collaborative environment that my interest in the representation of cities really came into focus and I made the photograph of the tower block that became the cover." Luxemburg was approached by the record company and agreed for her photo to be used after listening to some of the tracks on Original Pirate Material - the work of another incomer to the capital, the garage-inspired Brit-hop singer and producer Mike Skinner, who grew up in Birmingham. "I think that my work chimed well with the album," Luxemburg said. "Both the music and the photograph emphasise a particular urban, creative and challenging dynamic that is very present, yet often hidden, but always emerging. "She still lives near where the shot was taken, where the Islington skyline has been added to with more towers.Commenting on how the capital has altered in the time she has lived here, the photographer said: "Cities are always evolving and transforming; the changes in London, however, are turbo-charged." Universal Island records. Design: Studio Juice. Photography: Max Knight (2009)For the final stop on our album cover tour of the capital, we swap gritty high-rise living for perhaps the most fashionable shopping street in the country, the King's Road, which runs through Chelsea and Fulham.The year is 2009, and privileged folk rockers Mumford & Sons are posing in the window of a French furniture store, Pimpernel & Partners.The image of the well-heeled quartet became the front cover of their debut album Sigh No More, which would go on to sell millions of copies.And, even though the album is not yet 10 years old, the relentless pace of change in London has had its effect here too.At the start of April the Fulham furniture shop announced it was closing the premises and moving the business online.